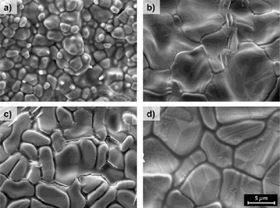 SEM images of (a) ZBS, (b) SmZBS-DM, (c) SmZBS-DOP, and (d) TmZBS-DM coating surfaces after two hours exposure to flowing air at 1300 °C. Sharp features of hypersonic vehicles increases heat transfer to the surface during flight. This thermal energy can be reduced via increasing the radiation and conduction heat transfer away from the surface. In this study, an emissivity modifier was incorporated into an ultra-high-temperature-ceramic coating system (ZrB2/SiC) to increase its surface radiation heat transfer rate by increasing the emissivity of the surface. The rare-earth were incorporated into the coatings via mechanical mixing Sm2O3 or Tm2O3 with ZrB2/SiC or chemically infiltrating Sm(NO3)3/ethanol solution into ZrB2/SiC. Coatings were fabricated using shrouded air plasma spray. Total hemispherical emissivity results show that the Sm(NO3)3 infiltrated ZrB2/SiC coating had a higher emissivity compared to the baseline ZrB2/SiC coatings up to 1200 °C. The thermal conductivity of all coatings presently studied was below 12 W/m/K. The presence of rare-earth in the boria-rich surface glasses formed during oxidation increases the glass evaporation rate of the coatings compared to the ZrB2/SiC coating. This paper was originally published in Journal of the European Ceramic Society, 34 (2014), Pages 1-11.